Tammy was a short-live series, starring Debbie Watson in the title role. 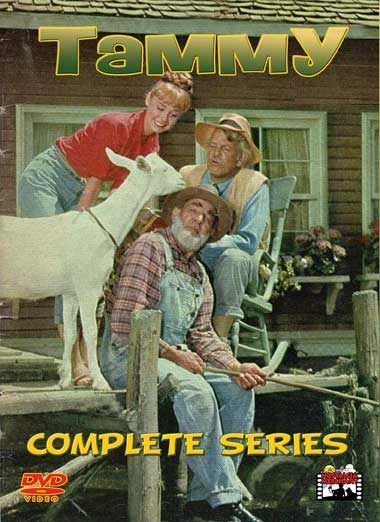 26 color half-hour episodes were aired on ABC from September 17, 1965 to March 11, 1966. Tammy Tarleton, is an 18-year-old country girl who moves back and forth between her country family, which lives on a bayou houseboat, and the wealthy Brents, who own a plantation and pancake business. Tammy is hired as a secretary by the powerful industrialist with a handsome young son. A high society dame who wants her own daughter to marry the son, repeatedly but unsuccessfully tries to smear Tammy’s reputation. Fun, family entertainment. The complete series. The Poker Game (10/8/1965); The Tarleton Land Grant (10/15/1965); Prophet And Loss (10/22/1965); Will The Real Dwayne Whitt Please Stand Up? (10/29/1965); Still Waters (11/5/1965); Mind Your Manners (11/12/1965); Grandpa’s Old Flame (11/19/1965); The Riverfyin’ Of Billy Joe Morgan (11/26/1965); Grandpa’s Secret Love (12/3/1965); Cletus Comes Callin’ (12/10/1965); The Enoch Bowl (12/17/1965); A Severe Case Of Matrimony (12/24/1965); T’ Know Me Is T’ Love Me (12/31/1965); The Law And Mr. Tarleton (1/7/1966); Lavinia’s Wedding Day (1/14/1966); Two For Tee Pee (1/21/1966); Blue Nose, Wet Nose (1/28/1966); The Monster From Catfish Bend (2/4/1966); Larnin’ Works Wonders (2/11/1966); Tammy Goes To Paris (2/18/1966); The Cinemazation Of Tammy Parker (2/25/1966); Uncle Lucius Returns (3/4/1966); Uncle Lucius, The Business Man (3/11/1966).